Big Agnes provides extreme comfort in their summer and winter bags, and the Air Core sleeping pad sets the stage! Coupling the Big Agnes Yampa down-filled sleeping bag we reviewed last year with the Air Core pad creates a complete sleeping system while you are out romping in the rugged Sierra Nevada, Colorado Rockies, or the great Smokey Mountains. Regardless of how cozy your down sleeping bag is, it’s important to choose a sleeping pad that will cushion your body from the tent floor and the hard ground. 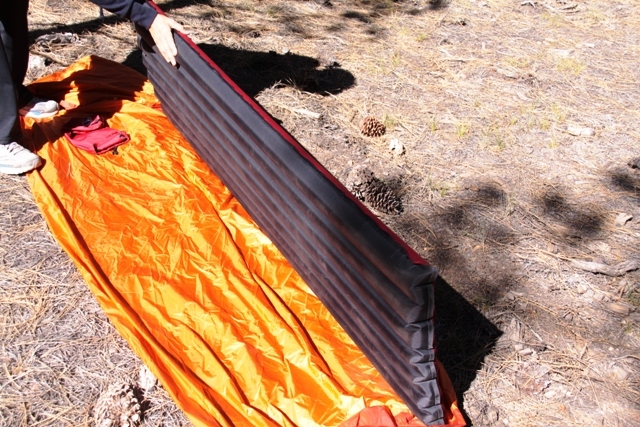 As important, to us at least, the sleeping pad should be easy to deal with and ultra-compact. Big Agnes gives guideline temperature ratings for all of their non-insulated and insulated sleeping pads. So you have several options for the type of backpacking and seasonal conditions you plan on using it for. The Big Agnes Yampa sleeping bag that was used with the Air Core, has an integrated full-pad sleeve that fit this particular pad just fine. The cool thing about the full-length pad sleeve is that you are less likely to roll off the sleeping pad in the middle of the night. You might peel of it, but you won’t likely roll off of it. That’s a nice touch. The non-insulated Big Agnes Air Core sleeping pads range in suggested retail price from $44.95 to $54.95, depending on the size you need and whether you are pairing it up with a Big Agnes Bag or other brand. Weight ranges from 16 ounces all the way to 22 ounces for the non-insulated Air Core pads, which are all dark red in color up top and gunship gray on the bottom. Big Agnes Air Core pad seen in relation to a Marmot Home Alone Bivy tent. It fit fine. dimensions of 20x72x2.5 inches. 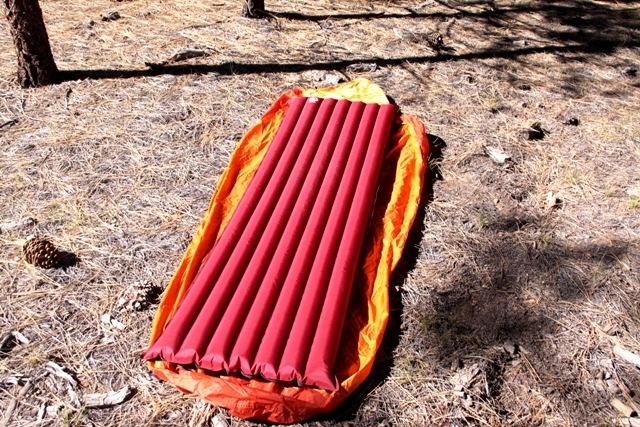 With a low-end temperature rating of 35°, this non-insulated sleeping pad works great for most types of back country overnight hikes this writer is likely to get herself into. Also, the Air Core sleeping pad was a great match for my 40° Yampa bag. The Air Core is convenient, compact and easy to use. That’s perhaps the best attribute we can share with you. The small packed size is welcomed when loading up the backpack. It comes in a water-resistant nylon stuff sack, with a rope-pulled cinched closure that bundles up nice, and alleviates the cumbersome bulk and clumsiness that so many other air-cushioned sleeping pads turn out to be, after you go to break camp and pack up for the trail. When you weigh the compact size with the price, as compared to some brands, you start to get the feeling how hideously overpriced others brands are, and how they pale in value. This assessment right here is what separates Big Agnes from others we have had the opportunity to take into the field. Again, we really liked how the Air Core rolls up in its own storage bag, making it convenient to travel with. An added bonus in the storage sack is a hidden pocket stitched into the bag. This “secret” compartment houses a repair kit that includes nylon patches, adhesive and repair instructions. Big Agnes Air Core EZ valve worked fine every time. It is important to follow the steps on the repair kit and use the materials that are provided for you. If the pad deflates unexpectedly, it’s important to find the leak first. Submerge the pad in a bathtub of water and look for a stream of bubbles. We didn’t experience any misfortunes with this Air Core, but it is always a possibility to be prepared for. It may or may not be necessary to use the patches provided; depending on the severity of the tear, the pad could possibly be repaired with the adhesive glue alone. 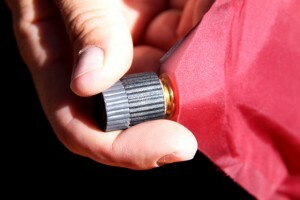 While some hikers use duct tape to make repairs, it is not recommended with the Air Core. The residue from duct tape is difficult to remove and might become an eyesore to the mountain lion inspecting its food source in the moonlit night! While an air pump might make any sleeping pad easier to inflate, the durable EZ valve makes it quite easy to fill the Air Core up at the end of the day. Keep in mind that the higher you go in elevation, the more challenging it could be to fill any air-cushioned sleeping pad. Being in great physical condition is always a good idea, but even if you are in perfect health it is possible to get light headed if you have not acclimated to the altitude you are operating at. This is just a thought for you to keep in mind if you plan on high-country backpacking while not necessarily having had much experience setting up camp at the end of the day after trudging like a packhorse crawling to the clouds. Take your time filling up your air mattress at the end of the day, even if you have to close the valve and take a break. By turning the valve counter clockwise, you simply blow air into the pad to inflate it, or Turn the valve clockwise to hold the air in. 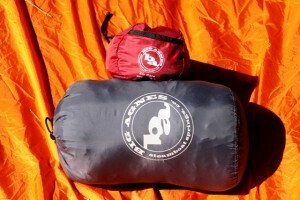 Big Agnes (BA) Air Core in stuff sack and BA Yampa sleeping bag show compact relationship. Both fit into the Osprey Xenon lower sleeping bag compartment with room to spare. In lower elevations, like a swift through-hike on the Appalachian Trail, filling the Air Core is a non-event. It was easy for our younger campers to help set up camp and get the Air Core ready to go. On one trip the stop watch clocked one youngster at less than three minutes to get the Air Core cozy plump. In general it’ll take about two and a half minutes for the Air Core to reach its comfort zone. The Air Core is designed to give you about 2.5 inches of separation off the ground and provided a nice cushion for our sleeping bag. Big Agnes does its part as a manufacturer that supports Green technology in their products, and that’s always a good thing. Big Agnes Air Core sleeping pads are made from recycled polyester, keeping the product lightweight and water resistant. The pad also protects the sleeping bag from ground moisture and that occasional boulder you missed when you lay down the tent floor before setup. The Air Core uses “Beamed construction” in the pad to reduce cold spots and allows the it to easily inflate and deflate. After removing all the air in the pad and rolling it up into thirds, it was no drama to tuck it right into the sack! And that’s what we value most about the Air Core; that and the price as a value that makes it a sleeping pad we can recommend to our friends and readers researching online for their first, or fifth, sleeping pad. When colder weather gets us to the slopes or some cool mountain lodge where some folks have to sleep on the knotty pine floor, like the middle of January when this little ditty was written, the Air Core still gets plenty of use. If you need to increase the insulation value of the Air Core, or any air-filled sleeping pad, you can use a closed-cell foam pad or other additional insulation options. As it stands for the winter of 2011, this Big Agnes Air Core has done a good job in whatever situations it has been taken to task. Here’s something we were not prepared for. Our young campers who were introduced to the Big Agnes Air Core, now want to use the sleeping pad whenever they spend the night a a friend’s house. They obviously love it, and have been vocal about the pad’s comfort. When you are searching for Kelty sleeping bags, you will find that the process is quite easy, because, beside the name of every Kelty bag, there is the number for indicating the temperature the bag is suited for.